UDM Downloads > HD Radio Classics - The Shadow Vol. 1! Relive the Golden Age of radio from Westerns to Mystery. Laugh with Burns & Allen, Abbott & Costello, or Jack Benny. Solve crimes with Sgt. Joe Friday, Sam Spade and Philip Marlowe. Clean up the Old West with Gunsmoke, the Lone Ranger or Have Gun Will Travel. Or solve a mystery with Agatha Christie. Before televison, families would gather around the radio on Friday nights to catch the latest episode of their favorite mystery or comedy radio program. 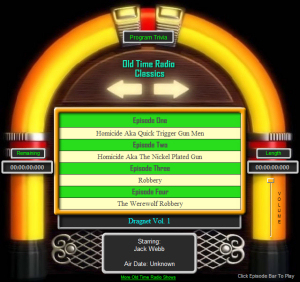 Now you too can enjoy the same with HD Old Time Radio Classics. More at web site.